Someone just starting to follow Buddhism asks: What is the state of being a Buddha like? What is reaching Nirvana like? What Buddhist scriptures tell us is, in fact, often abstract and mysterious. Take “Nirvana”: it is interpreted as neither germinated nor terminated, and neither produced nor destroyed. Such terms are so obscure that one wonders if they could be adequately explained in modern language and made thoroughly understandable to us. Indeed, the state of being a Buddha or reaching Nirvana is beyond description by any language. The effect of using words to express the truth of things is often limited at any rate, usually one-faceted and generally deficient. Hence, many Buddhist texts employ adjectives such as “unimaginable” and “unspeakable” to imply limitations inherent in language. For one thing, personal emotions may not be totally conveyable by words, let alone the state of Buddhahood. Research has found that the human nose distinguishes more than 10,000 scents, and yet strangely, the language that humans use to describe these smells is extremely incompetent. One may speak of the fragrance of a lotus blossom, for instance, as being clean and pure. Beyond that no matter how superb one’s literary or linguistic talent, it is impossible to truly depict what its aroma is. Only those who have smelled it know exactly what the fragrance is like. Overall, using language to describe any smell is a rather inefficient way of communication. It simply shows that the human sense of smell is far sharper and more rigorous than the power of human language. The Land of Fragrance Accumulation is such an amazing place where smelling fragrance leads to enlightenment, and where even the Buddha uses fragrance to convey the one and only way to Buddhahood. Faint aroma drifts in late at night. 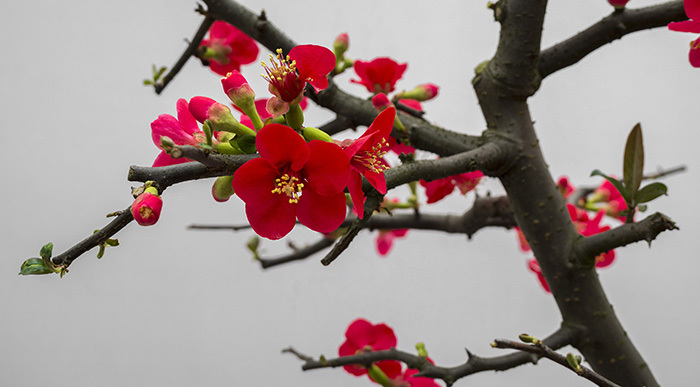 The poem tells about an early plum blossom on a snowy night, gently giving off a clean and pure fragrance that reached Master Hanshan’s sense of smell. In an instant, he attained the true meaning of the reality of all phenomena. He was then sitting by a dim light by himself on the cold night, with not a single word of Buddhist scriptures on his desk. Fully mindful, the Master broke through the barriers of language, and with the fragrance he inhaled, became awakened to the truth of the universe. Master Hanshan’s sense by the nose took him significantly beyond the reach of words. From the above one can see that the state of Buddhahood or Nirvana, not identifiable simply through the moderation of language, must be pondered with deep wisdom to be fully appreciated. The true reality of all phenomena can be discerned, then, only when Buddhahood is achieved, and that, I am afraid, is beyond the grasp of the uninitiated. Born in Hong Kong, the Venerable Guan Cheng holds a BA in Economics and a MBA from the University of Toronto. In 1981, he founded the International Buddhist Temple in Richmond, BC, Canada. In 1999, he became ordained as a Buddhist monk under Venerable Xulang, and in 2009, founded the Vinaya Samadhi Prajna Lecture Hall in Hong Kong as a base to launch his charitable projects and dharma-propagating activities in Asia, including Dharma talks and lectures, releasing of animals and sea lives, poverty relief and student aid, and exhibits for his publications and video/audio recordings at the annual Hong Kong Book Fair.